Its backers say the largely symbolic bill is a statement about equality. The legislation, House Bill 216, clarifies that it "does not require or place a duty or responsibility on the state or a municipal government to print a document or record or conduct a meeting, assembly, or other government activity in any language other than English." 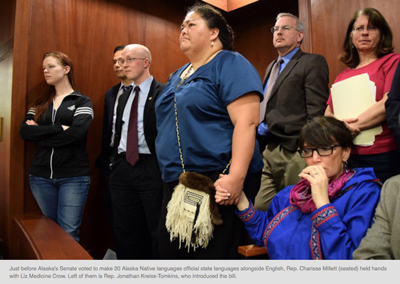 But the bill does put 20 Alaska Native languages on a par with English, which as NPR member station KTOO reports was made the official language of the state by a 1998 voter initiative. "That's all we want is equal value," Lance Twitchell, a professor of Native languages at the University of Alaska Southeast tells KTOO. "And there's nothing wrong with standing up and saying that. It takes a lot of courage to do that. And it takes a lot of something else to try and go against that." The bill was endorsed in Alaska's House of Representatives last week, in a 38-0 vote. To ensure its passage before the current legislative session, supporters of the bill organized a 15-hour sit-in at the Capitol that started around noon Sunday. In the early hours of Monday, the Alaska Senate approved it 18-2. The language bill may be symbolic, but to some of the folks who spoke to KTOO, it means a lot.